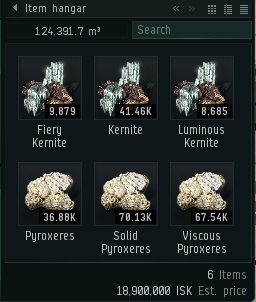 Waste is a big problem in highsec today. Luckily, our Agents are experts at efficient repurposing. We can transform AFK miners into content--and we can put their possessions to better use than they ever could. Agent Aaaarrgg helped himself to an unpiloted Orca that he deemed to be property of the New Order. It was completely unfit, too. 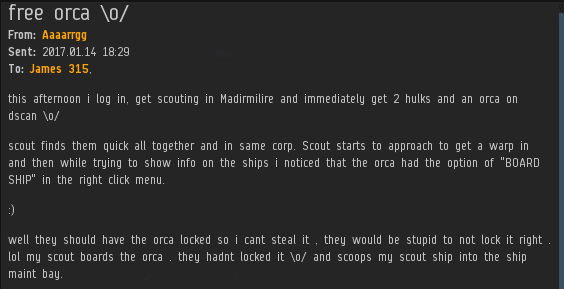 The miner in question had been using the Orca as a jetcan. CCP intended to eliminate can-flipping long ago, but carebears will be carebears. The miner compounded his error. It's a good thing our Agent was still there to help him correct it. The industry of the New Order: We produce joy from the unlikeliest of raw materials. Neat bit of opportunistic enforcement there Agent Aaaarrgg; situational awareness, don't they call it? I'll keep an eye open for that, but I think the rebels round here are attached by the umbilical to their wretched ships. And I don't have an Orca pilot. Yet. And that boys and girls is how it's done!! Haha. I've seen this before too. It's hilarious. I don't know why they don't just use enormous freight containers if they want to can mine. Surely, the possibility of losing some ore is more palatable than losing some ore-ca. Welcome to highsec, home of the highsec shitters. 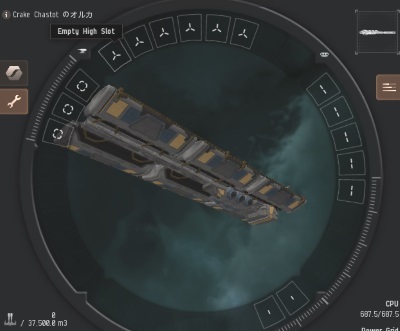 Can mining into an unfit Orca while oblivious to the mechanics of the game they "play". Talk about shitters, anyone seen Codex Biovector's stream? Yea I didn't think so. Sorry but watching ag fail does not make for good viewing. You dont need a stream when we are the content to begin with. Who wants to watch a streamer dock up when CODE,the stars of the show enter system? the fact the scout can pilot an orca says it all, serious split personality. Use some common sense and you'll understand why he has those skills trained on an alt. All in the line of duty. An Agent should be able to take advantage of any opportunity afforded him/her in enforcing the Code. Also, Ghillie suits are/were a thing once. Despite my aversion to the ship, I've often disguised myself aboard a venture in order to bomb and shoot nuisance faction and other drones in the asteroid belts. Agent Aaaarrgg has displayed exemplary skill and training. Ag , failing at eve since 2012. That is a long time to fail. Ooooh what about the "growing resistance" in Jita, that one shitter was trying to "warn" CODE about a couple days ago? With friends like Codex, how could they not. Crake Chastot was thrilled with his innovative stragegy to achieve maximum mining yield. Not many people know that the fleet hangar of an unpiloted ship is still accessible. He was patting himself on the back. Who would ever guess?